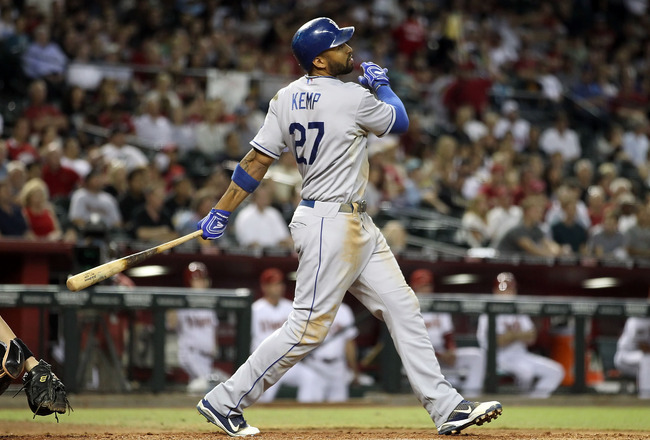 Matt Kemp - on an absolute tear to start the season. Write fielder Andrew McGilligan picked Kemp to win the MVP in the National League. This looks like the only prediction he has right to start the season. McGILLIGAN: We’re about 10 per cent through the regular season, so its time to check in on the preseason predictions. Analysis: Not one of the teams I predicted are in first place. I know its early and the Yanks and Tigers are close, but it’s the Angels that surprise me. All that money spent by the halos to be cellar dwellers in the West. Analysis: The Ranger are already six games up in the West and have looked unbelievably good this season. Despite its terrible starting pitching and injury woes – not to mention Bobby V – the Sox are one game below .500, so there’s still a good chance the ship can be righted in Beantown – maybe. Analysis: Not one of these three are in first place and the Phillies look old this year. The Cardinals are playing great ball in the central, but the biggest surprise is in the West. Magic Johnson’s mojo is doing wonders for the Dodgers who have looked like world beaters this spring, thanks to an unbelievable start by Matt Kemp. Analysis: Arizona has hovered around the .500 mark, but it’s the Marlins that have looked awful with a power outage from the bats and poorly chosen words from Ozzie Guillen. Analysis: I’m sticking with it. Original Reason: With Fielder doing the job of Victor Martinez providing protection for arguably the best hitter in the game, I see another outstanding year on the horizon. Analysis: Cabrera is near the top of most offensive categories and has meshed well with Fielder. I still like this pick, but Josh Hamilton is the early season front-runner as it stands. Original Reason: He’s developed other pitches to go with his great fastball and I think this is the year he puts it all together. Original Reason: I was tempted to go with Yu Darvish or Yoenis Cespedes (honestly either one could have been my pick), but I’m going with the Rays rookie hurler Matt Moore to take the honour. Analysis: Cespedes and Darvish are looking great and definitely in front of Moore this spring. Original Reason: Can’t see why he wouldn’t be just as great this year as last. New ownership makes it a more stable place to play, which can’t hurt. Original Reason: I don’t ever like to bet against Roy Halladay, so I won’t. Chalk up another trophy for Doc. Analysis: I still like Doc. If he can get some better run support, then the trophy is within reach. Original Reason: I wanted to slot in Bryce Harper, but I decided to go out to the left coast and predict Padres rookie Yonder Alonso comes home with the award. Analysis: The NY Mets Kirk Nieuwenhuis and Cards Matt Carpenter have been impressive thus far. Alonso has struggled early, but has plenty of time to get into a groove.However, this could all be moot as Harper is now playing for the Nationals. 1. Ozzie Guillen conducts an entire press conference using nothing but Spanish curse words. Analysis: Insert ‘praise for Castro’ instead of Spanish curse words and I’m bang on. Analysis: Still a lot of season left, I’m not counting this out. 3. After being thrown out of a game, Bobby Valentine dresses up as Matt Damon, sits next to Ben Affleck near Red Sox dugout and tries to coach using various hand signals being relayed to David Ortiz. Analysis: I wish this was the embarrassing thing Bobby V did this season…sadly it was not. However, win and all is forgotten. WILDCARDS – LA Angels, Minnesota Twins. Analysis: Man. I’m a genius. Honestly, who saw the Texas Rangers coming? That one must have shocked the world…everything else is looking hopeless. I’m starting to get really close to the panic button for a couple of things, and Jose Bautista, and Albert Pujols are both among them, and this from a staunch supporter of guys with track records. Minnesota isn’t going to win crap if they don’t get their timing together. Sure, they’re sixth in the league in team batting average, but they’re 21st in runs scored. I saw their pitching as not great, but competitive. I guess the basement (5.69 ERA) isn’t quite competitive? I’m not even gonna talk about the Tigers and the Yankees. We all know offenses like that can turn it around, and as a Jays fan, I don’t really care if my predictions are wrong here, although I still see them as right. The Angels will grab a wildcard, teams like the Orioles and Indians aren’t staying up top. Analysis: I like where I am across the board here. St. Louis is looking good, and could punch holes in my Cincy love affair, but once again a killer offence is a killer offence, and I think the Reds, ala the Yanks and Tigers, can go on a run. Arizona and Colorado aren’t there yet, but I have to believe they will turn around too, or else my picks are junk, and I’m not ready to bale on either yet. Let’s not forget that the Indians are in first in their division right now. The Indians people. My honorable mention might not work out here (Lorenzo Cain) as the Royals flounder again, but I’m plenty happy with my pick. Darvish is going to take this. He dominates right handed batters (as a lefty! ), and I thought an improved cut fastball and a steadier curve was going to result in even splits and a career season. Right now it feels like Kemp is actually pissed he didn’t take this trophy and will be fighting off his ace from pulling a National League Verlander-type sweep…but whatever. It’s early and Tulo could turn it on. LIVINGSTONE: Well, yep, my predictions…just look and laugh. Analysis: The Yankees look like the Yankees, the Red Sox, well, they look like the bottom of a dumpster to start the season and it’s unclear whether or not they will pick things up. The Jays. Geez, it wasn’t supposed to be solid pitching and weak hitting – with a questionable start to the bullpen – that started this season off for the Canadian club. But hell, things aren’t looking terrible. Detroit and LA…I don’t know what to say. It’s a slow start for both teams – hitting in LA is awful and pitching in Detroit is looking nothing like it did last year. RATIONALE: Washington is looking like the team to beat right now. The starting rotation is out of this world good and are putting up quality starts all over the place. Hitting, well, it could be better, but a surprise start by Adam Laroche and the eventual return of Michael Morse, closer Drew Storen and hopefully Ryan Zimmerman – along with the call-up of Bryce Harper – should keep this team rolling along. San Fran is playing like they should and Pablo Sandoval and Buster Posey are prime to be one of the best 3-4 combinations in the game this season. RATIONALE: I said the Angels were the real deal before the season started. I still think they are. CC hasn’t looked dominate, but he still looks to be a solid 15 to 17 game winner. Called it. He’s mashing the ball. Sluggish start, for the Canadian kid and the Reds, but he’ll pick it up. Looking like a contender for this award. He’s been near-untouchable this season. He’s picked his game up as of late, but he hasn’t performed to the high-calibre that has been expected of him.